Aprilia's repertoire in making some of the most exciting performance motorcycles needs no introduction. 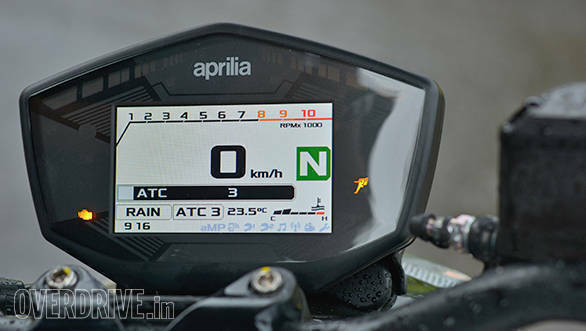 We were smitten by the Aprilia Tuono V4 1100 Factory and RSV4 RF when we tested them, so obviously our ears perked up when Aprilia launched the Shiver 900. 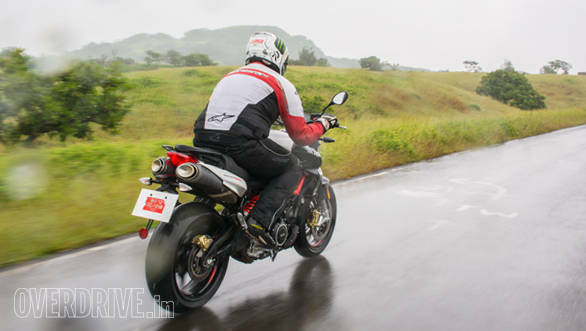 The middleweight naked segment is teeming with interesting motorcycles though, and in fact has seen a few launches this year already including the Kawasaki Z900, Triumph Street Triple and MV Agusta's Brutale 800. Does the Shiver have what it takes to make the competition shiver? We put it through a thorough test to see. Unlike other Italian manufacturers, Aprilia has always traded off gorgeous design for aggression, and the Shiver 900 does not buck that trend. Its sharp edges make for an old school look, particularly the triangular headlamp and lines on the fuel tank. Head-on the appearance is typical of streetfighters with a hunkered down stance. Air intakes on the tank extensions add to that stance, while also accentuating the bike's width. The Shiver is a large motorcycle with a long, 1440mm wheelbase, and is closer to litre-class machines in size. The red trellis frame, cylinder heads and monoshock made for a nice contrast with the white shade of our test bike, while the 'be a racer' stickers on the wheels looked eye-catching. Twin underseat exhausts are an old school design, but make for a distinctive looking rear end. So distinctive, that at first glance you'd be baffled as to where do exhaust gases come out from! The end cans look like they've been sealed shut with metal discs but look closely and you'll notice they have openings at the sides. The instrument cluster is a multi-coloured display the size of a smartphone in landscape mode. I would have liked a bigger display but admittedly it is excellent to look at with its crisp resolution and bright colours. It offers lots of information, and menu options are easy to access via the toggle switch on the left handlebar. The instrument cluster also houses shift lights that use a design and arrangement similar to some of the Ducatis, with an array of lights in different colours glowing incrementally as you get to the redline. An 896cc, liquid-cooled, 90-degree V-twin powers the Shiver 900, offering 95PS and 90Nm. 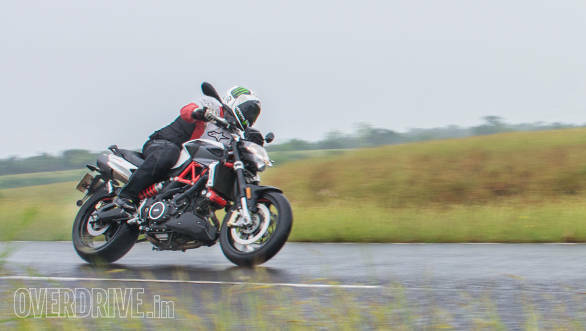 Most modern day middleweight nakeds boast outputs in the region of 110-120PS, but with 90Nm of torque on offer from just 6500rpm, the Shiver 900 feels anything but underpowered. The engine comes mated to a slick-shifting six-speed gearbox that offers precise shifts. The Shiver also uses a hydraulically operated clutch, but does not get a quick shifter. 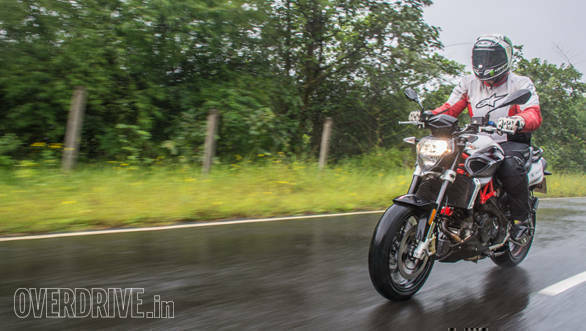 The Shiver 900 gets ride-by-wire technology which brings with it the provision of riding modes. The Shiver gets three, Sport, Touring and Rain. You also get three traction control levels, though you cannot turn it off. 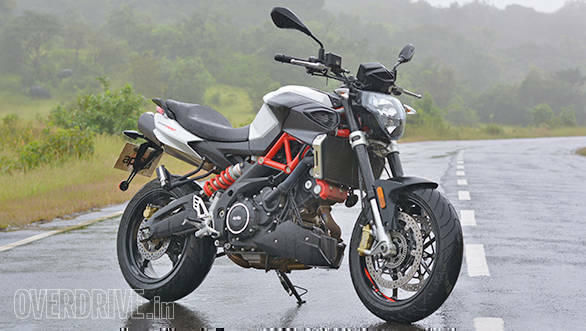 The engine sounds typical of V-twins though the exhaust note is throatier thanks to the peculiar exhaust design, and only gets gets angrier in Sport mode. Crisp throttle response and the meaty midrange punch make for rapid progress in Sport mode, and in fact in traffic you're better off switching to touring mode given the aggression. Peak power is produced at just 8750rpm unlike several other middleweights that are essentially derivates of high revving sportsbikes, which explains the punchiness at low to mid revs. Performance tapers off strongly as you close in on the redline that sits just above 9000rpm though. 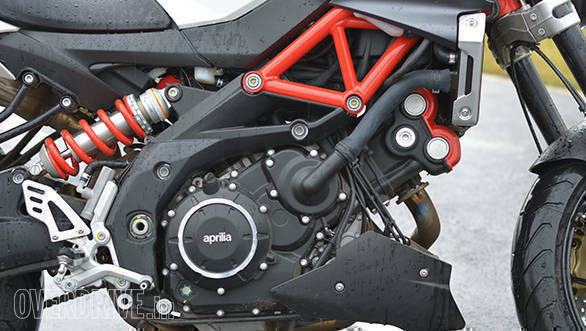 Gearing is on the shorter side as well and clearly, Aprilia has aimed for a package that offers quick acceleration at usable revs. The day of our test was a wet, rainy one and the Shiver only managed a 0-100kmph time of 5.12 seconds in our VBOX tests. The fact that traction control cannot be turned off didn't help either, as the system kept intervening. On a dry day, the Shiver should be about a second quicker. On the fuel efficiency front the Shiver 900 returned 14.32kmpl in the city and 20.77kmpl on the highway. The Shiver uses 41mm, fully-adjustable upside down forks and an offset mounted fully-adjustable Sachs monoshock. The bike is held together by a trellis frame and is a confident handler, but feels large and heavy, lacking the compact, nimble feel most new age middleweights offer. Make no mistake, the Shiver is a good handling machine but its kerb weight of 205kg holds it back from feeling agile. In size, the Shiver 900 is almost the size of a full-blooded litre-class naked and feels like one to ride too. It feels planted, be it leaning into corners or at speeds with its long wheelbase and suspension setup but show it a set of chicanes or try to slice through traffic and you're left wanting for some more alacrity. 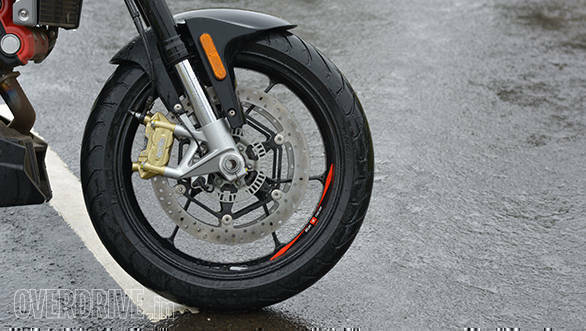 The Pirelli Angel ST tyres (120-section front, 180-section rear) offered good grip even in the wet. With Rain mode chosen and traction control set to the highest I was fully confident leaning into corners, with the rear twitching ever so slightly at exits. This kind of handling prowess isn't a surprise given Aprilia's expertise in making fast motorcycles, though I wish the Shiver felt nimbler. The heavy feel in fact holds the bike back from offering the full potential of its engine. The wide handlebar makes for good leverage but a sharper steering and lighter feel would work wonders for the dynamics. The suspension is good at soaking in bumps and undulations  big or small  and the Shiver 900's ride quality is pretty impressive for our roads. The Shiver's V-twin engine is arguably the motorcycle's biggest highlight with its refinement, likeable performance and soundtrack. In fact, the engine is a great example of Aprilia's engineering prowess and makes the Shiver engaging to ride. The old school design may not appeal to everyone though. The fact that the Shiver is a big motorcycle unlike most other modern middleweight makes it look distinctive and might appeal to those looking to make a statement but could turn off someone wanting a compact motorcycle. The handling is confident but laidback, which again isn't everyone's cup of tea. What's more, the Shiver comes in via the CBU route and is priced at Rs 11.99 lakh ex-showroom. At its price, the Shiver 900 is significantly more expensive than the bikes like the Kawasaki Z900 and Triumph Street Triple, names that enjoy huge popularity apart from boasting better designs and dynamics. While Aprilia does enjoy a lot of popularity in the more exclusive litre-class space with the Tuono and RSV4, the Shiver 900 doesn't come across as very exciting. It is a capable motorcycle and boasts high levels of refinement and engineering but doesn't feel special. 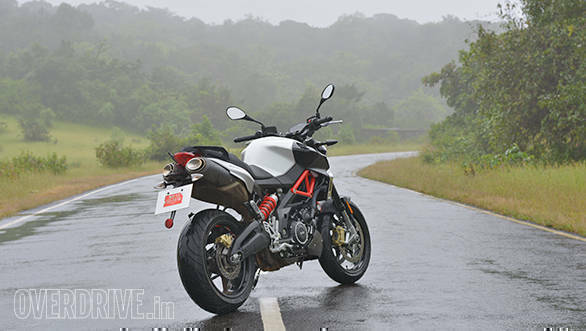 If Aprilia is serious about making inroads into the middleweight segment, the Italian manufacturer needs to consider local assembly as that will help it price the Shiver more competitively and also make the bike more appealing.